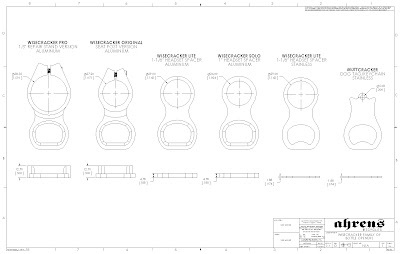 It's been five years since the first WiseCracker bottle opener was machined and introduced to the bike market. This unique product enjoys continued success and ships all over the world to beer drinking bike riders everywhere. Just in time for warm weather riding, I've decided to offer a more complete range of WiseCrackers for your alcohol consuming enjoyment. 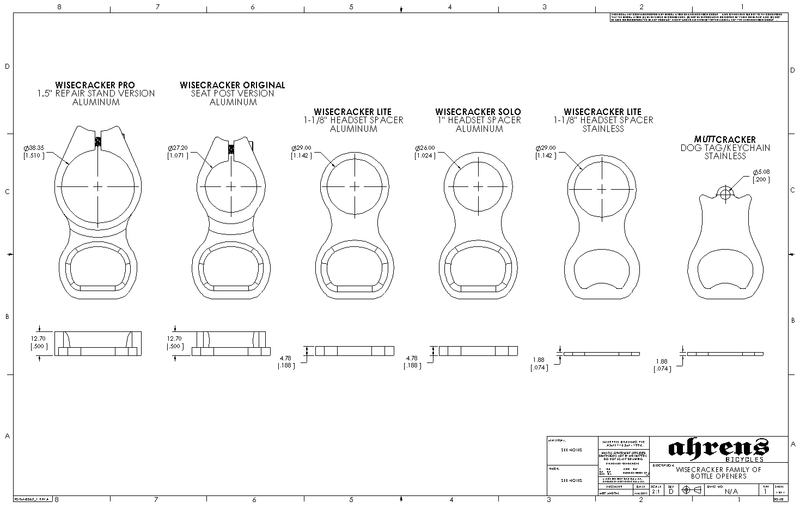 Each version of the WiseCracker is proudly manufactured in the USA using only domestic materials and processes. As Henry Ford said, "It's offered in any color - so long as it's black." Why not other colors? The aluminum bottle openers are hard black anodized for durability; this plating process builds a thick oxidation layer that penetrates the part to protect it from damage during use. Hard anodizing produces a surface ~10X harder than conventional, colored anodizing. Hard anodizing colors range from light brown to black, so I use black since it matches nearly everything. Colored anodizing creates a very thin oxidation layer and although this finish looks attractive, it offers no long-term durability in terms of wear. And for a small company like mine, there are just too many anodizing color choices to inventory. Each version of the WiseCracker can be custom laser-marked for your shop, club, team, event, etc for a reasonable price. This version is water-jet cut from a sheet of stainless steel. It is low profile and weighs the same as its aluminum cousin, 16 grams. The MuttCracker will turn your pet into a mobile beer-opening mammal. It's permanently laser marked with your pet's name, contact number, etc. The MuttCracker is the brainchild of my very smart dog-owner friends, Lee and Donna, and both are also proud owners of handmade frames from Ahrens Bicycles. This version is also water-jet cut from a sheet of stainless steel and weighs in at a svelte 18 grams. Hydraulic Disc Brakes for 700c? !